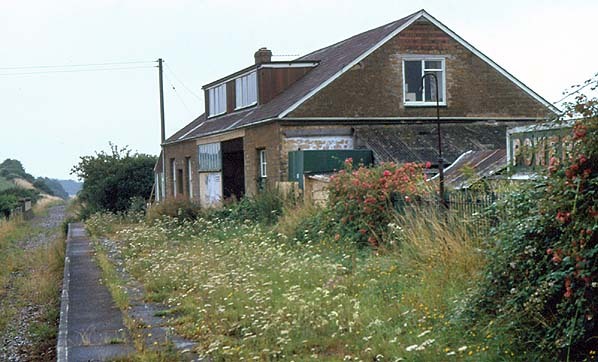 Present state: The station was sold in November 1968, 6 years before closure of the line. The building was modernised with a loft conversion which included windows facing onto the platform. Since closure, there has been little change other than filling in the passenger recess which has now been incorporated into the house. Inside the building there is little evidence that it was ever a station apart from the ticket window that has been retained. The platform surface and edge stones have been removed in back of the house to make a raised garden. The north-west end of the platform remains largely intact including some original railings at the back of the platform. The track bed has been grassed as part of a much larger lawn. 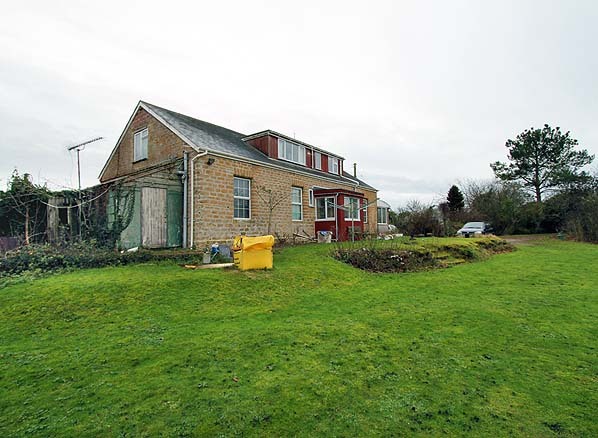 The property includes the whole of the quarry at the front of the station building. The goods dock along the front of the building was divided into two sections. The part immediately in front of the building has had its edge stones removed and is now little more than an earth mound. The section to the west retains its edge stones but the track bed has been filled almost to the top of the dock. A small stone building stands in the goods yard on the far side of the sidings. This is an original building but its purpose is unknown. 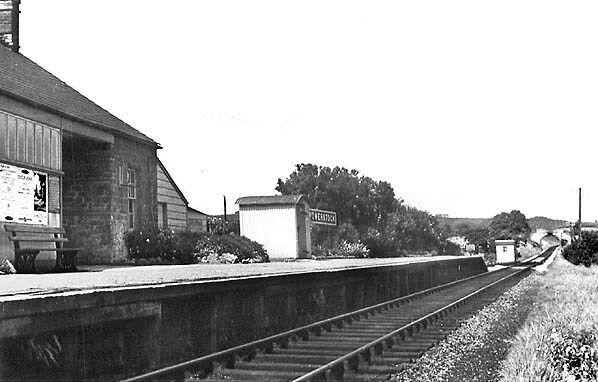 Notes: Powerstock station was shown as ‘Poorstock’ in both GWR and Bradshaw timetables until 1860. 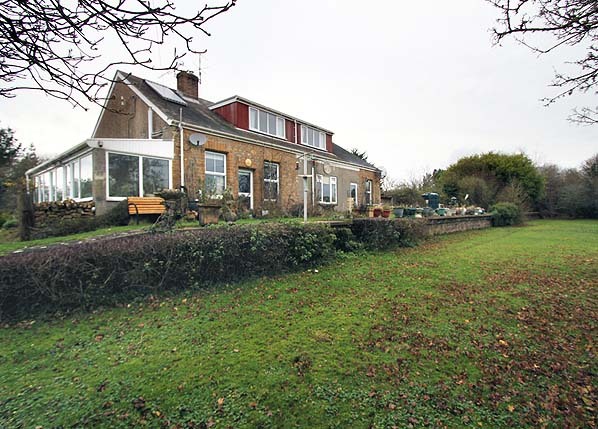 It took its name from a small village about a mile to the north, but also served Nettlecombe – a hamlet on the road from Powerstock – and some isolated farms. flat-topped dormers protruded from the roof and a conservatory was added to the south-western gable end. Immediately south-west of the station there was a bridge over an unnamed lane. 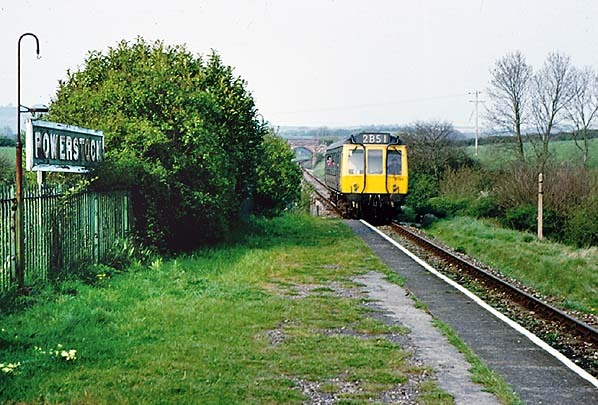 A quarry opened a very short distance west of the station and was served by a siding which diverged from the goods siding (behind the platform and building) which itself left the branch north-east of the platform. By 1929 the OS map no longer identified the quarry by name, so it had presumably closed. 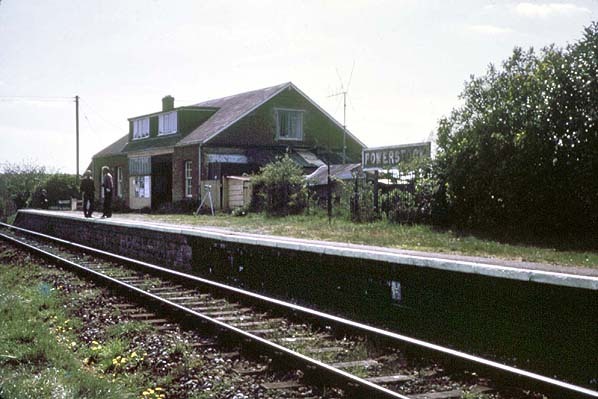 By 1963-4 only one siding remained behind the platform. 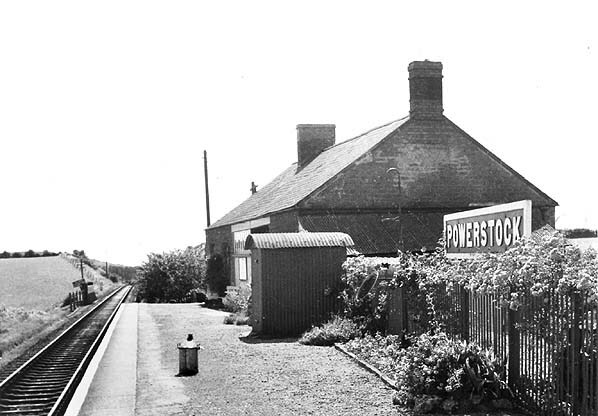 Powerstock station was unstaffed from 11 April 1966. 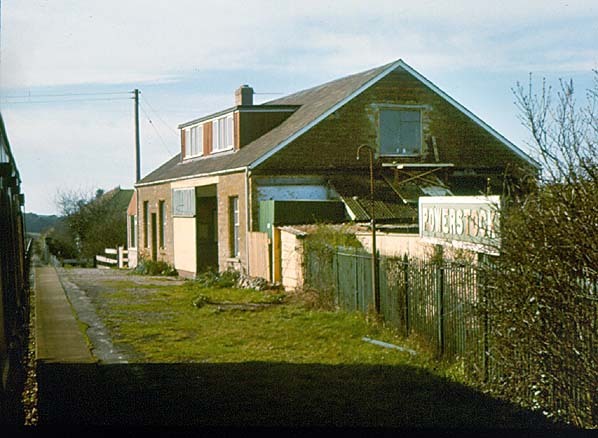 The station building and goods yard were sold to Brian and Diana Read in November 1968 for £3,250. Passengers could still shelter in the recess. It remains as a private residence and the Reads are still there. Diana Read has written a book (101 pages) about the station called Powerstock Station - All Change. It was privately published in 1995 (revised 1996) and copies are available from D P Read, The Old Station, Powerstock, Bridport, Dorset, DT6 3ST. Tickets from Michael Stewart except 0488 & 0959 Brian Halford. Bradshaws from Chris Totty . Route map drawn by Alan Young. Looking south-west at Powerstock station c1950s. Beyond the GWR nameboard is a post with a cradle to hold an oil lamp. The corrugated iron shed stands in front of the austere single-storey station building. An unknown object stands on the platform. 1902 1:2,500 OS map.Two sidings north-west of the station enter from the north-east, one serving the quarry adjacent to the station, and the other for general goods traffic. The short approach road can be seen south-west of the station building. Powerstock station looking south-west from a passing train in January 1956. A wagon stands in the goods siding on the other side of the station building. 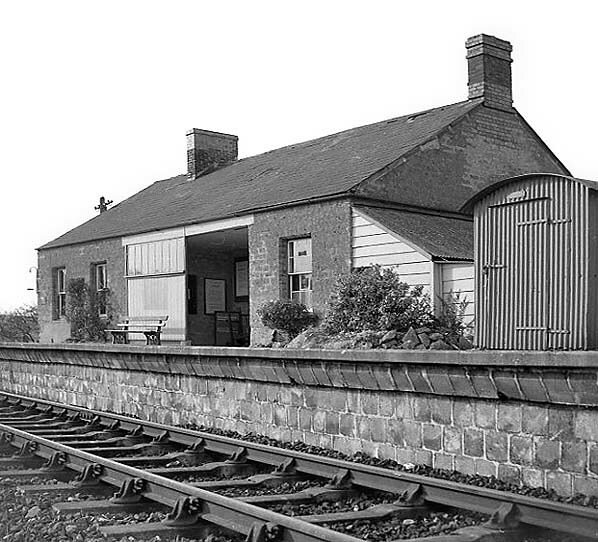 Powerstock station looking north in 1959. 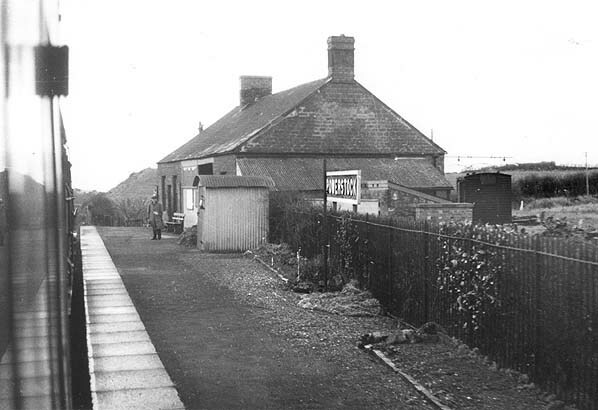 This useful angle, looking west – probably in the early 1960s – shows the construction of the platform which appears to have been re-faced since the photograph of 1959. The interior of the waiting area in the main building can be seen, including the booking office hatch and a couple of notice boards bearing timetable or other information. A bench is provided on the platform. A southbound train arrives at Powerstock in 1972. The goods yard with one of the two adjacent docks, is seen on the right. The yard closed on 13 March 1961 and the track was quickly lifted. Powerstock station seen from a passing train in March 1974. 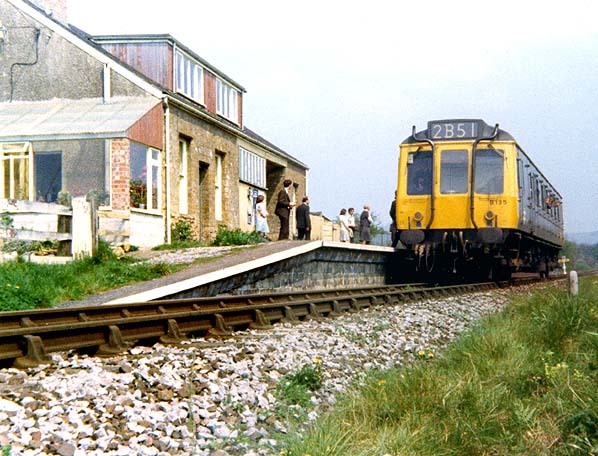 A single car DMU arrives at Powerstock station in April 1975, 9 days before closure. Powerstock station looking north-east in April 1975. The station has been a private residence since November 1968. Powerstock station on 3 May 1975, the last day of public service. 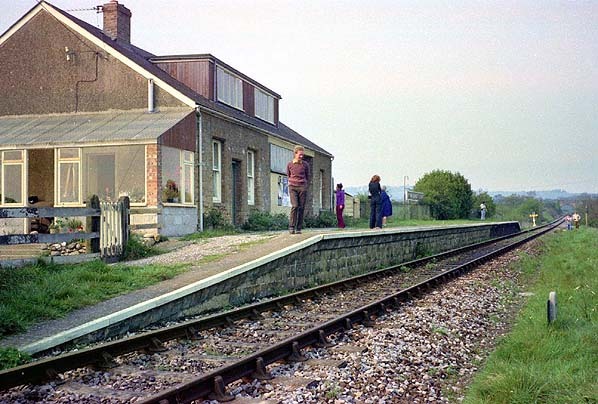 A single car DMU stands at Powerstock station on 3 May 1975, the last day of public service. There have been few passengers in recent years but the station was a little busier in its last week. 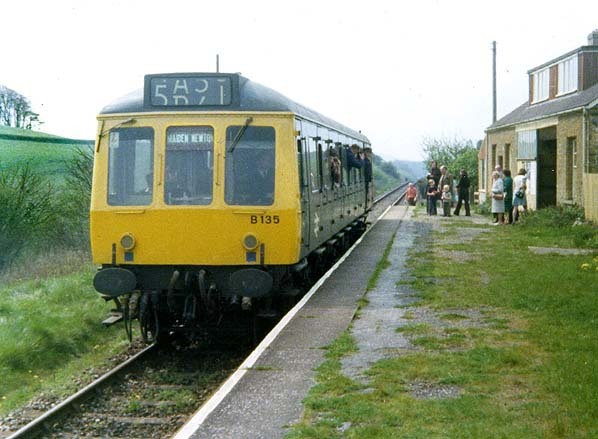 A single car DMU stands at Powerstock station on 3 May 1975, the last day of public service. 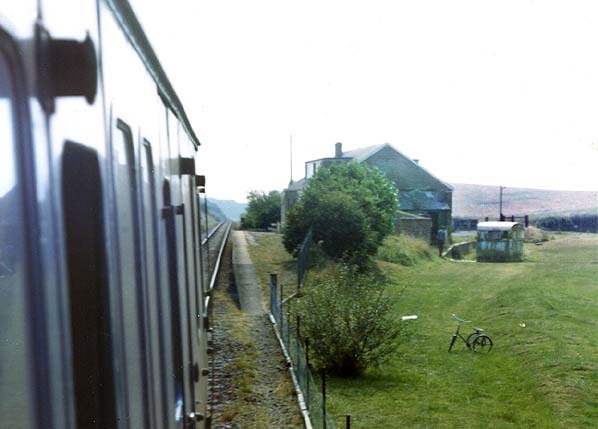 Powerstock station looking south-west in August 1977. Powerstock station in December 2011. Powerstock goods yard in December 2011. The degraded remains of the goods dock can be seen in front of the building. A siding diverging from the single goods siding served the quarry and ran through the bushes on the right.